As you're planning out what to see and do at the 2019 Game Developers Conference later this month, make sure you leave time in your busy schedule to check out some of the cool games and exhibits available at the show! GDC 2019 Community Spaces like the Indie MegaBOOTH Showcase, the Shut Up & Sit Down board game lounge, and the Mild Rumpus will all be conveniently located in the West Hall of the Moscone Convention Center during GDC, each with their own smorgasbord of intriguing games to play. Plus, organizers are excited to confirm that two very unique games, Puppet Pandemonium (winner of an Alt.Ctrl.GDC award!) and the Klaxo Radio Hour, will also be playable in the West Hall in their own standalone exhibits. Both are innovative games with custom-built control setups that are fun to play with friends (Puppet Pandemonium practically demands it), so make some time to check them out! 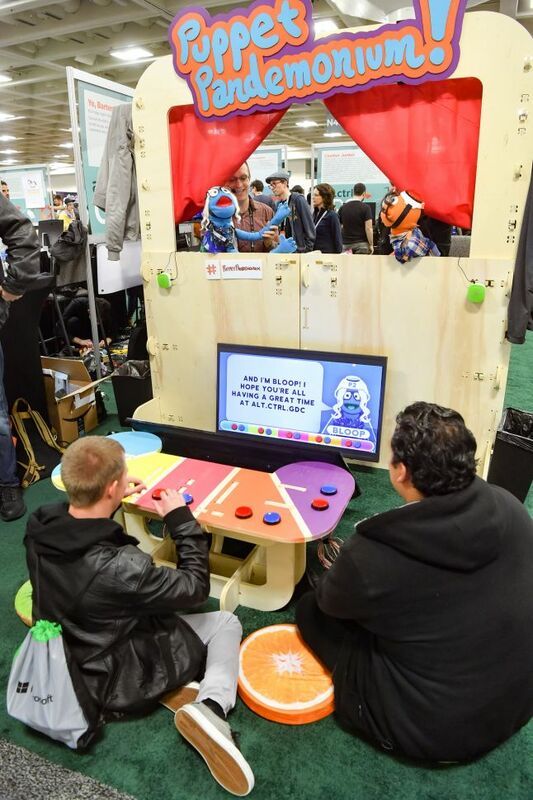 As you can see in the image above, Puppet Pandemonium proved to be a popular experience when it was on the GDC 2018 Expo Floor as part of that year's Alt.Ctrl.GDC Showcase. This year it will be back (albeit in the West Hall, instead of on the Expo Floor) and playable by all GDC 2019 attendees, along with Klaxo Radio Hour. And if you haven't started planning out your time at the show yet, now's the time -- and it's easy to get started! Just head on over to the GDC 2019 Session Scheduler; there you can begin to lay out what talks you want to see at GDC 2019, which takes place March 18th through the 22nd at the (newly renovated!) Moscone Center in San Francisco.